Produktinformationen "Kustoms Illustrated Issue #39"
If words like Candy Apple, Tuck 'n' Roll, Wide White Walls, Frenched Headlights and Flipper Caps gets your blood pumpin', then you are going to dig KUSTOMS ILLUSTRATED! Every 64 page issue is jam packed with photos, articles, news, artwork and event coverage pertaining strictly to '40s, '50s and early '60s style custom cars. 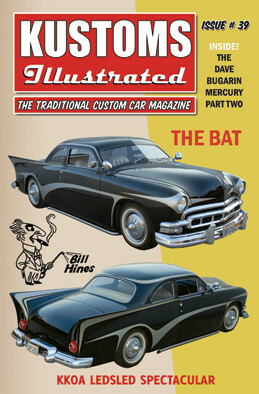 Kustoms Illustrated is published four times a year in the old "digest" style format (5.5 X 8.5) just like the cool old magazines you remember from the '50s. The magazine is 64 pages long and in FULL color! Weiterführende Links zu "Kustoms Illustrated Issue #39"
Kundenbewertungen für "Kustoms Illustrated Issue #39"